Doesn’t beer-steaming sound like the most wonderful thing on Earth? That said, I seriously think I could beer-steam everything ever. Beer-steamed chicken? Why not? Beer-steamed sushi? Sounds scandalous! Beer-steamed salads? Where’s the dotted line? Beer-steamed SAUNAS? A) I think that might have been a redundant double negative, but B) Who rightly cares? It sounds awesome. Oh and honestly, I don’t even know if the hyphen if necessary in all of that. It just makes me feel at peace. But today, we’re gonna steam these little babies. Also, I’ll do my very best to NOT call them babies as I’m about to induce their beer-steamed demise. Also #2, there’s a video at the end of this post, so don’t go anywhere. HOO HOO HAHHA HA HAHAAAAAA. So this has a Mexican flair to it, with minced jalapeno peppers, a lot of garlic, cilantro and lime juice. Oh and a quick hear ye, hear ye: I left all of the seeds and ribs in the peppers, because I like my face to rain, but honestly, it wasn’t spicy at all. I think all the liquids in the steaming process maybe mellowed it all out. So if you’re on the heat fence about it, leave it all in! But also, I’ve heard that jalapeno pepper A can be way hotter than jalapeno pepper B, and that no one can ever truly know. So in other others, go with your gut. Your heat gut. Trust yourself, and only yourself. Your heat self. Did I mention there’s a video at the end of this post? 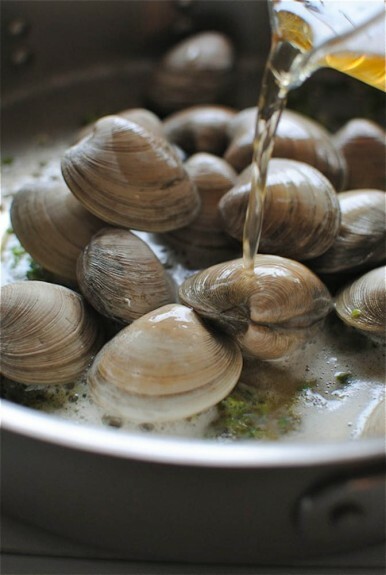 I love steaming clams because you hear all the little pips and pops as their shells open up. And you get to go pearl hunting! I’m just kidding. Although I’m not lying when I say I thought I saw a pearl in one of these clams, and then realized it was just a beer bubble. And that I was also looking in the wrong animal. You have to make this! Takes like 5 seconds to pull together (after the prep work) and then you get to sop all of that cilantro-y, garlicky, peppery beery broth with huge chunks of crusty bread. Serve them in one huge bowl for a date night, or divide them up into little bowls if you have guests over. Whatever you do, don’t clam up! 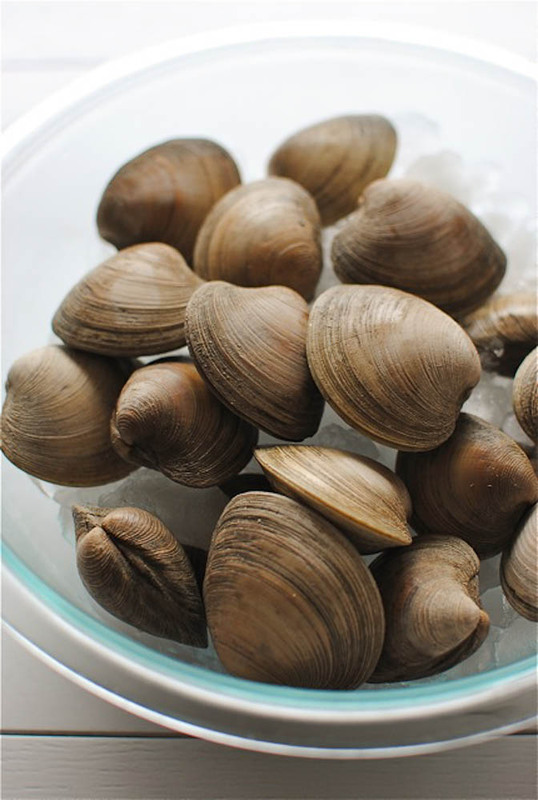 Keep the clams on ice until you’re ready to clean and cook. Oh we’re ready? Okay. Dump the clams into a large bowl and cover with room temp water. Let sit for 20 minutes. Drain the water. (It’s going to be pretty sandy.) Add more water. Let ’em sit another 20. Drain the water. Add more water. 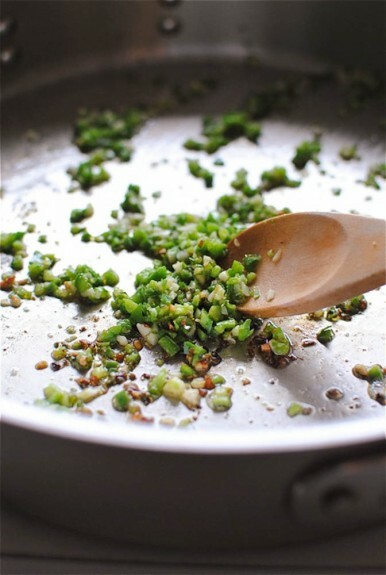 Now, add 1/2 tsp salt and let sit for 20 more minutes. Drain the water. Give the clams a good scrub and set them aside. Now, fish out the clams and arrange them in little bowls. Back in the pan, add the cilantro and lime juice. Let simmer and reduce for about 5 minutes. Pour the beery broth over the clams and baybaaaaaay. Serve with crusty bread and a nice big green salad! But you should know, sometimes things happen before you steam them. Case in point, this Vine video illustrates what unfortunately happened to me as I was cleaning them. Ouchie. DeLallo Gourmet Gift Boxes! All the Noshing. Best vine video to date. Hey - do you want to grab a quick clam sauna after yoga later? Let me know. photos aren't blurry crack head. and YUM!!!!!! Video = Such a nerd. I love it. ^_^ Wanna learn some Chinese? 啤酒蛤辣 (Spicy beer clams) Favourite dish EVAH!!! Ooooo I have no idea what that means but I like it! Wow, that video put a huge smile on my face! Brightened my morning! 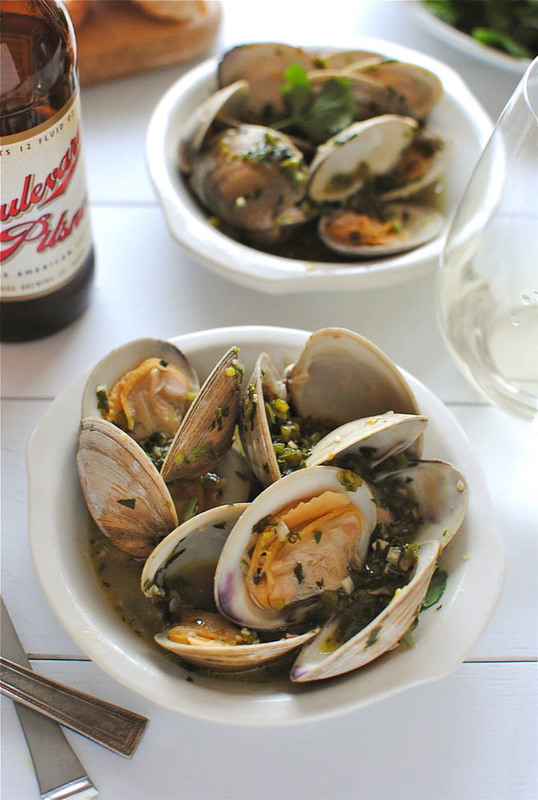 Beer steamed clams! Genius! 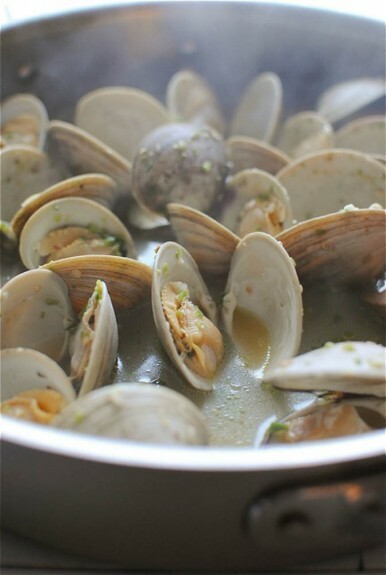 I'm slowly learning to love clams, I bet they're wonderful beer-steamed! So stinkin' funny, you. So stinkin' delicious, these. Love it all. MMMMmmm this is so something I would make if I could get fresh clams! Loved your vine on the clams, my 10 yr old watched it so many times I had to yank my phone from her. HA! best video ever! beer steam me. I can't read this without dying laughing over your Vine video! Your vine videos kill me haha. Hilarious video aside, how much do you love that faucet?! Oh I loooooove the faucet. Home Depot, if you're in the market for one! You are hilarious. I can't quit watching! OMG, awesome video!! You should upload it to youtube!! Laughing out loud. This recipe looks awesome!! I wish I knew how! Bev you couldn't take a bad picture even if you wanted to! Annnnd beer steaming sounds amazing, so these will be happening asap! And now I just watched your video and about peed my pants! HILARIOUS! Your video for this - seriously hilarious. Yaaaaaay! Beer steamed clams have been in my head a while but I haven't done it yet. I'm just going to go to your house and force you to make me some. We steam them in white wine all the time. Never occurred to me to use beer! Such a great idea. And seriously... these pictures are fab as always. And love the video. Ha!! Love the video!! 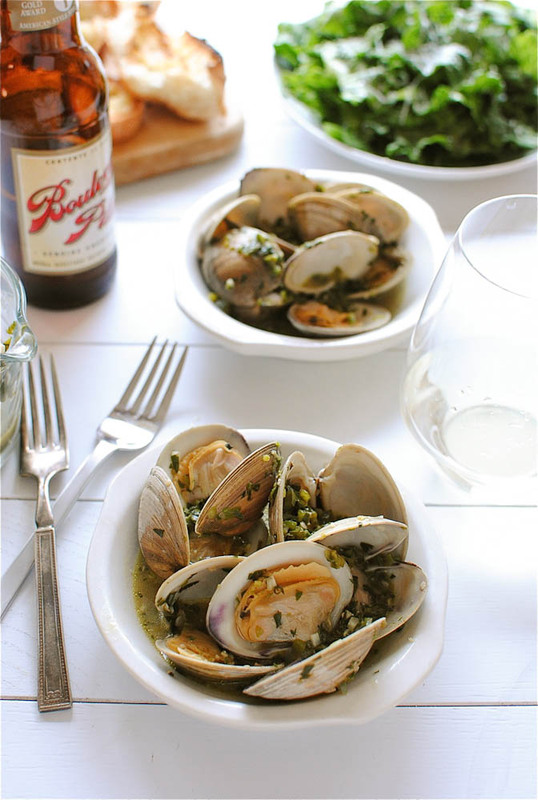 This recipe looks amazing I love steamer clams and so does my husband and hes a huge fan of beer - totally going to be making this soon!!! Hahaha, I just watched that video like 3 times and laughed each time. On another note, this broth sounds amaazing. Oh no way, you did!? That's it. I'm going hunting. Hello there. Simply needed to consult a simple problem. I am just piecing together my weblog along with would want to realize exactly where you got ones style? Ended up being this free of charge? Or ended up being that paid out? I am unable to appear to uncover whatever as effective as this place, consequently ideally you possibly can i want to understand. Many thanks. PS, my i'm sorry. Uk seriously isn't my own 1st words.